Prototype: Swiss Federal Railways (SBB) class Re 6/6 as the class Re 620 heavy electric locomotive. 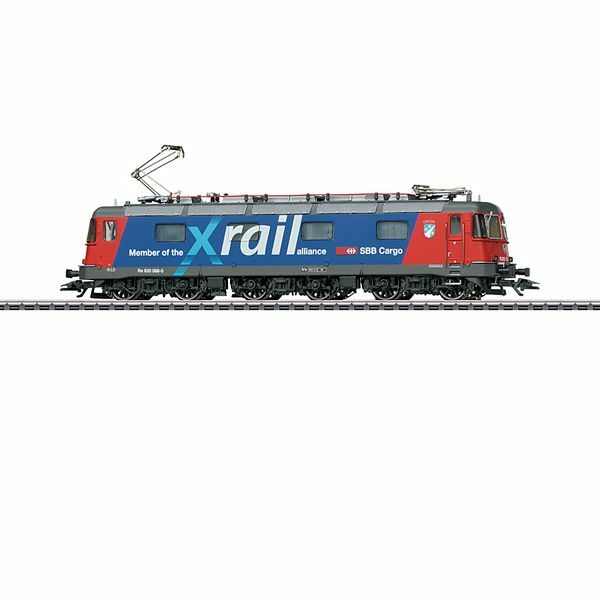 Version in a "Fire Red" / ultramarine blue basic paint scheme, with side lettering "Member of the Xrail alliance" for Xrail, Inc., Brussels, Belgium. Rectangular headlights, UIC plugs, diagonal grab irons on the ends, a maintenance hatch on one side for air conditioning. Locomotive road number 620 088-5, with the locomotive coat-of-arms for "LINTHAL". The locomotive looks as it did around 2014. Model: The locomotive has an mfx+ digital decoder and extensive sound functions. It also has controlled high-efficiency propulsion. 2 axles powered in one truck. Traction tires. The triple headlights and 1 white marker light (Swiss headlight / marker light code) change over with the direction of travel, will work in conventional operation, and can be controlled digitally. The headlights at Locomotive Ends 2 and 1 can be turned off separately in digital operation. When the headlights are off at both ends, the double "A" lights are on at both ends. The lighting can be switched to 2 red marker lights. Maintenance-free warm white and red LEDs are used for the lighting. The locomotive has separately applied metal entry grab irons. The couplers can be replaced by detailed end skirting. The minimum radius for operation is 360 mm / 14-3/16". Length over the buffers 22.2 cm / 8-3/4". It was and still is something special – the Swiss Federal Railways (SBB) Re 6/6. For a long time it was viewed as the most powerful electric locomotive in the world and still has this rating in Switzerland. Naturally, such a high performance as 8,020 kilowatts / 10,755 horsepower could only be applied to six axles, hence the rather unusual wheel arrangement of B-B-B for central European circumstances in order to combine the resultant tractive effort with good running characteristics on curves. The center truck had to have appropriate side play and the three trucks are connected to one another by means of elastic cross couplings. Based on these specifications, the SBB ordered four different prototypes in 1969 from SLM (mechanical parts) and from BBC (electrical parts). These four units were placed into service by the fall of 1972 and were then exhaustively tested. After a final version began to emerge, the SBB ordered 45 production units of the Re 6/6 from SLM/BBC as early as February 23, 1973. Delivery of them began in 1975, was carried out within two years, and was completed by 1977. Delivery of the second series of 40 Re 6/6 locomotives (road numbers 11650 - 11689) took place immediately thereafter from the end of 1977 to the end of 1980. From then on heavy EC, IC, and express trains as well as the heaviest freight trains with up to 1,600 metric tons were the domain of the Re 6/6 locomotives on the Gotthard and Simplon lines. This did not change until the turn of the century when all of the Re 6/6 units were assigned by 2003 to the new freight service group SBB Cargo. It is still impressive today, when an Re 6/6 fights its way up the ramps of the Gotthard with a long freight train. Even more impressive is the so-called "Re 10/10", the double-heading of an Re 4/4II and an Re 6/6, which has become an everyday sight at least on the Gotthard line.